Rare opportunity in the heart of Palm Springs. This beautiful, single level, updated 2 split BD / 2 BA condo has an open-airy floor plan, high cathedral ceilings, dramatic gas fireplace, bar, inside laundry, ceramic tile floors throughout, skylights, clerestory windows, walls of tall sliding glass doors in the living room and master bedroom, both of which have magnificent mountain views and open to the large, private, enclosed courtyard patio with a bubbling water fountain. 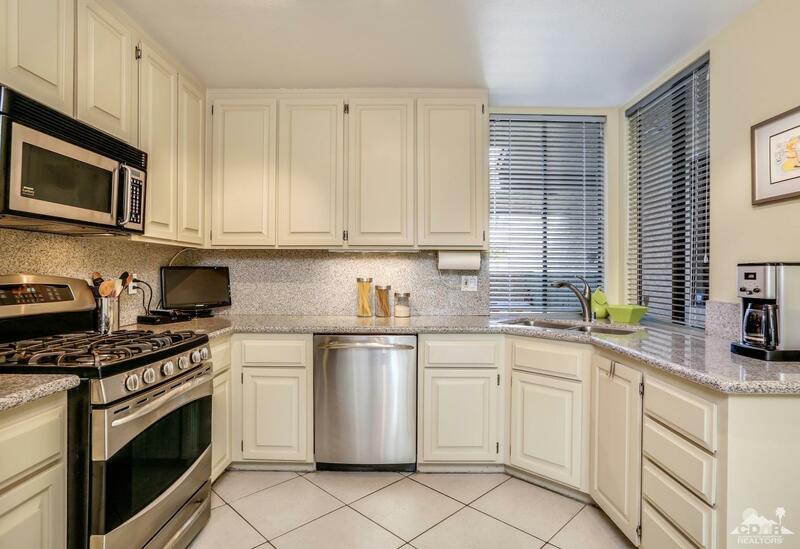 The large kitchen has slab granite counters, stainless appliances and 2 pantries. The bathrooms also have slab granite counters and the master suite has a walk in closet, double vanities, huge sunken tub and separate shower. Palm Regency resembles a high end luxury resort and has beautiful greenbelts, 2 pools/spas, clubhouse and 2 tennis courts. There is also a single, attached garage with lots of storage and a covered carport leading into this home. Just a short walk to exciting, revitalized downtown Palm Springs!